Description: Erect tufted perennial to c. 0.5 m high, often thickened, scaly and hairy at the base. Leaves with sheath ± glabrous; ligule c. 1 mm long; blade to 2.5 mm wide, sometimes with scattered tubercle-based hairs. Inflorescence to 5.5 cm long, axis pubescent. 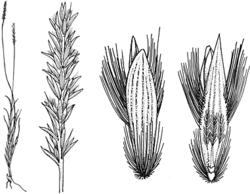 Spikelets 5.5–7 mm long with hairs to 3.5 mm long at the base. Lower glume 7-nerved, ± glabrous; upper ± pubescent on the lower 50% and on an oblique lateral line on each side c. the middle. Lower lemma 3.7–5 mm long, mostly 5–7-nerved; palea to 1.7 mm long or absent. Upper lemma 3–4.5 mm long; palea longer than the lemma, hyaline, with thickened auricles embracing the flower.